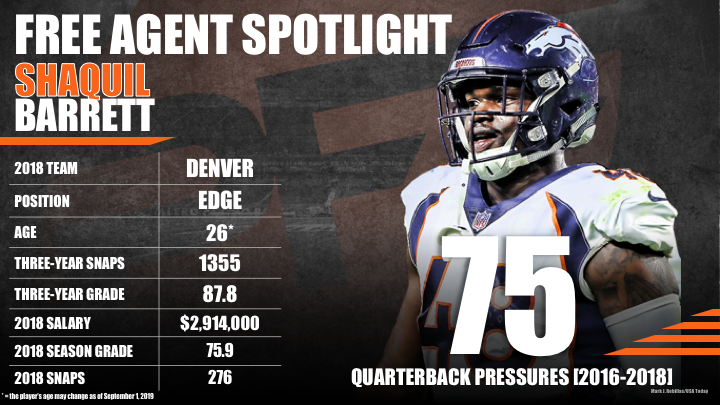 After signing the one-year, restricted free agent tender for 2.914 million, edge defender Shaquil Barrett saw his opportunities decline in 2018 after the Denver Broncos spent the fifth overall pick on Bradley Chubb. Barrett has played solidly when given the opportunity, but he produced only 13 total pressures on a career-low 127 pass-rush snaps. However, Barrett is just one year removed from a career-high 82.6 grade and 43 total pressures from 324 pass-rush snaps in 2017. Expect the previously undrafted Barrett to seek a team willing to bet on his youth (26 years old) as well as his 2017 and previous production (pass-rush productivity as high as 26th among edge defenders) and give him more opportunities to rush the passer. Subscribe to Pro Football Focus’ ELITE subscription to research Shaquil Barrett’s grades, advanced stats, snaps and more in Premium Stats 2.0.